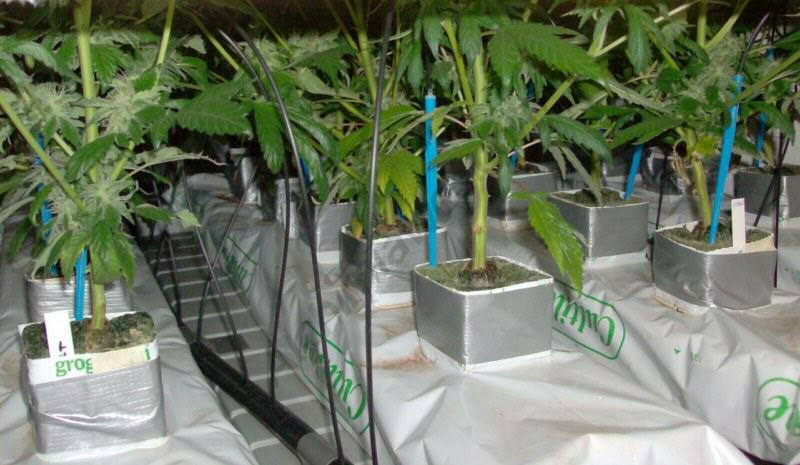 SOG or Sea of Green is a marijuana growing technique used to take advantage of all the available growing space. Basically, we only need to completely cover the whole space with relatively small pots, as many as needed. The number of pots used will depend on both the size of the pots and the available space. 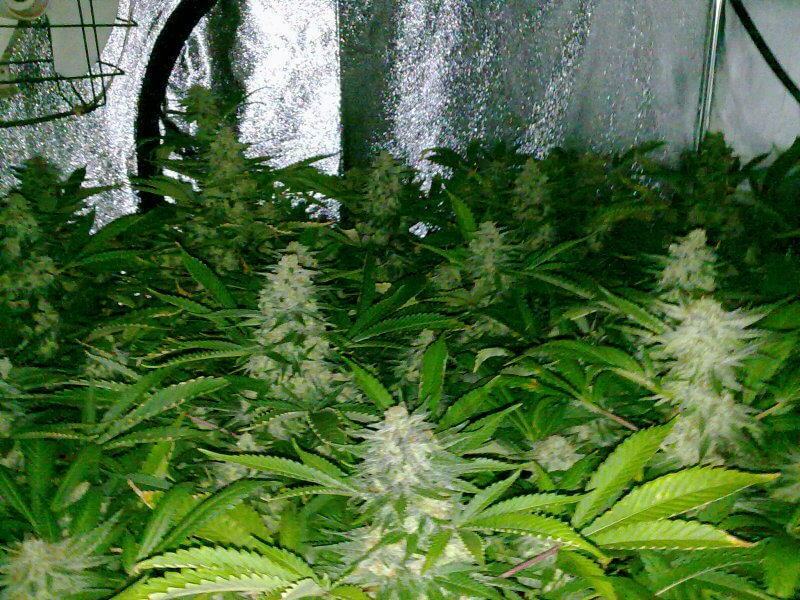 For our example, we will use a 1m2 growing tent and tell you a few tips that everyone should remember in order to achieve a successful SOG crop. The main goal of this kind of cultivation is reducing as much as possible the time needed to grow and flower the plants, while getting the best possible yield of our growing space. 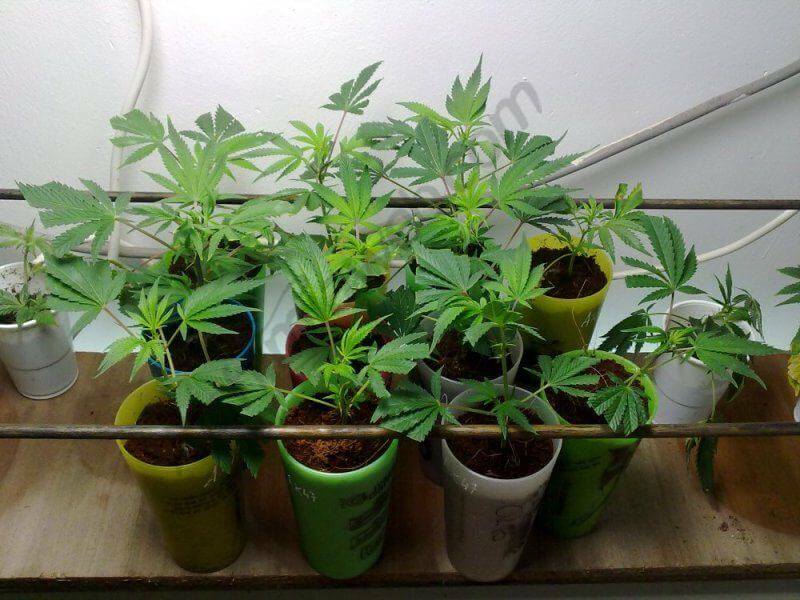 With this method, one can achieve the same results in two months – using cuttings – than in 3-4 months when growing cannabis seeds . Saving money in our light bills or being able to perform more crops per year are some of the benefits from this interesting growing technique. After getting all the needed growing gear (pots, lighting systems, fertilizers, etc. ), the first thing to do is growing a motherplant from which we will take cuttings . For this kind of cultivation, it is very important having identical cuttings from the same motherplant – or at least from the same genetics – to achieve a homogeneous crop. Working with several genetics will surely cause problems regarding size, height, flowering time, nutrient needs, and a number of factors that will decrease the overall yield of the plants. Once we have our motherplant ready, we should determine how many plants we are going to use per m2. ; the amount of cuttings may depend on several factors and needs, but 25 plants/m2 is a good number to start with. Now we know how many cuttings we have to take from our motherplant and how many pots are needed to plant them. It is advisable taking more cuttings than needed; this way, we can keep the best 25 ones for our growroom and discard the rest of them. We must choose the stronger and healthier ones, with similar heights, discarding those that would not form a homogeneous crop, what is crucial when using the Sea of Green method. Another important aspect of this system is the type of irrigation that we are going to use for our plants. The best option is setting up an automatic watering system with dippers, connected to a nutrient solution tank. In this way, all plants will receive the same exact amount of nutrient solution, what will equally increase the production of all the plants. Plant each cutting in its respective pot ; we can perform a couple of transplants before flowering our plants, and the final pot’s size will depend on the used substrate. If we are using coco coir, 3-4 liter pots will be perfect; otherwise, if we use soil, we should use bigger containers, about 5-6L. Transplanting our plants saves space, helps to control the height of the cuttings and promotes growth with a shorter internodal distance, improving yields. As the growth period of our clones will be short, we must use a quality root stimulator to enhance root growth, so they can quickly develop a well-formed rootball. Roots will drastically slow their growth after the pre-flowering stage – 2nd/3rd week of flowering – so we can stop adding root stimulator to the nutrient solution at this time. Our plants should only have a main central bud with 2-3 side branches. We can prune the lower parts of the plants if needed, for we only want perfectly formed buds which usually only develop at the tops of the plants. Plants should be about 35-50cm tall at the end of the flowering stage, so growing either Indica or Sativa strains is of key importance. We don’t want taller plants since the light emitted by the bulb would not reach the lower parts of the plants, developing few and squalid flowers. Indica marijuana strains are generally smaller and more compact than Sativas, which take more time to stop growing once the pre-flowering stage ends; for this reason, if we are using Sativa varieties we’ll flower them a bit sooner than the Indicas. The sea of green, (SoG), method is something that I’ve thought many times about trying. 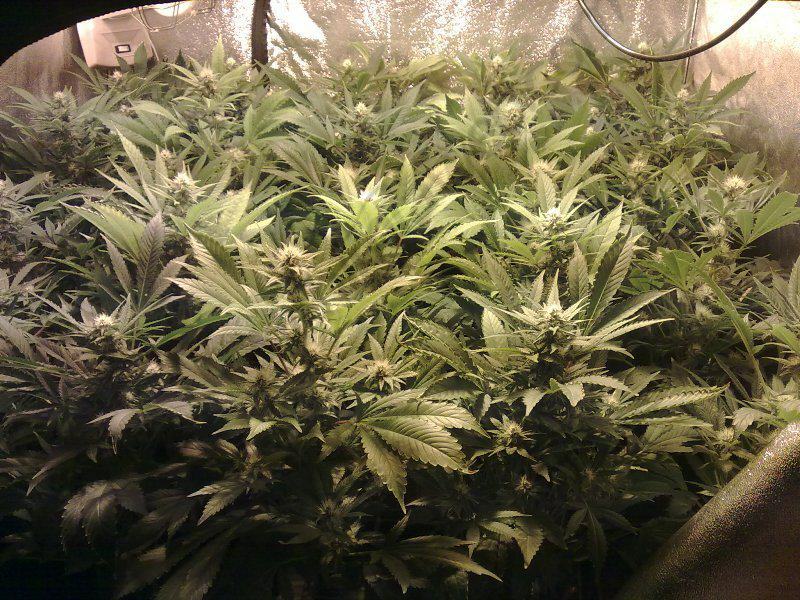 The issue for me is that, while I do live in a state where I can legally grow for medicinal purposes, the law says I can have no more than six plants flowering at one time. Chances are, nobody will ever be checking me to make sure of how many I have, and I have certainly spent most of my life ignoring marijuana laws but, I’m quite happy to be able to grow legally, and I don’t want to jeopardize that right. So, I guess for me, SoG is something that will have to wait. Nowhere does it state how much shorter the flowering period is? Growing smaller plants means they can be harvested quicker? So from my usually 20/30liter pots 10 weeks flowering plant… The SOG method in 3liter pots will take 6weeks? Not at all, the flowering period will always be the same no matter how big the plant is. The pot size (and of course the length of the growth cycle) will determine how much the plant will grow, but if your plant takes 10 weeks to flower it doesn’t matter if it’s 50cm or 2m tall, it will still take 10 weeks. 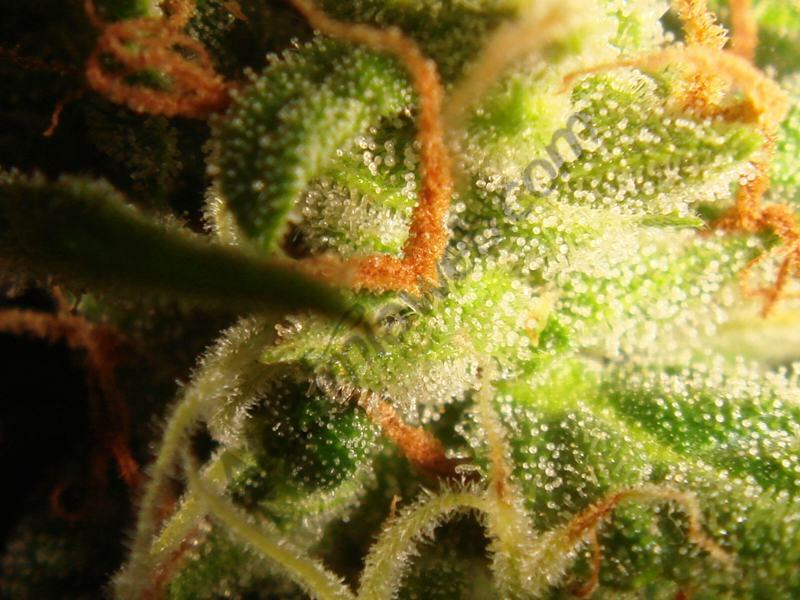 What happens with the SOG method is that you don’t need prolongued growth cycles since you want to harvest small plants; you save time, but shortening the growth stage, not the flowering stage. This is for my standard growing method, how would this change if I was doing SOG? Growing with the SOG technique basically means using lots of small plants per m2, which have been for a short period of time under a growth photoperiod (usually, the best option is using clones). In this way, if you’d like to do a SOG you would use the same feeding schedule, since your plants would need the same period of time to bloom. Could any body tell me the best lighting system to use that can do the job well but doesn’t bring much attention to the electric bill. Also, providing all go’s well, and all the variables are correct, how much yield would i expect on average with 10 plants spaced in this area with 30cms sq each over a period of say 8 weeks. First of all, most grow tents on the market are square to take advantage of the light emitted by the bulb at most. Thus, rectangular grow tents are designed to fit two lighting systems, which spread light much more uniformly. With the dimensions that you mention, and taking into account that you don’t want your electricity bill to be too high, I would probably choose LED systems. While notably more expensive than HPS systems, they’ll produce little heat (something interesting for you, since your growing space is relatively small). A cheaper option would be 250 or 400W HPS systems, although you’ll probably need a potent extractor fan in this case. With those dimensions, and if everything goes ok, you should get around 400-500gr of dried buds (always depending on equipment, strains grown, feeding, environmental conditions, etc). According to the manufacturer, the Mars Hydro 48 can be compared to 100W HPS and is recommended for 70x70x160cm grow tents. According to the power of the LED system, I’d expect around 100gr of dried buds, almost 4 ounces. Still, it all depends on nutrients, genetics and environmental factors like temperature and humidity, CO2, etc. The SOG technique is normally used with plants that develop a prominent main stem and few side branches, and ideal for cuttings! Often, old school growers keep on using the same “old” techniques (most times with excellent results, I must say). The game has changed a lot, but many of us are still growing like we did in the 90’s, perhaps with slight variations but we’re basically doing the same that we were doing 20 years ago. Grown tents are affordable, come in many different dimensions, are easy to assemble and provide amazing results. Also, LED systems and new generation HPS lamps (which we’ll be soon offering) are being increasingly used, especially by professional growers. Not to speak about new genetics!!! Good Led systems provide excellent results. 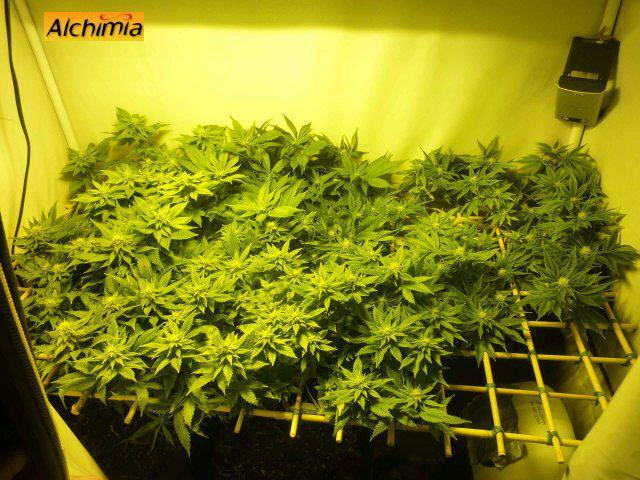 They’re often compared with twice the power in HPS (200W LED = 400W HPS). In my honest opinion, this comparison is a bit too optimist, but yes, LED systems are usually more efficient than HPS lamps. New to sog. What is the best feeding and watering cycle to follow? It is ok to contact via email. 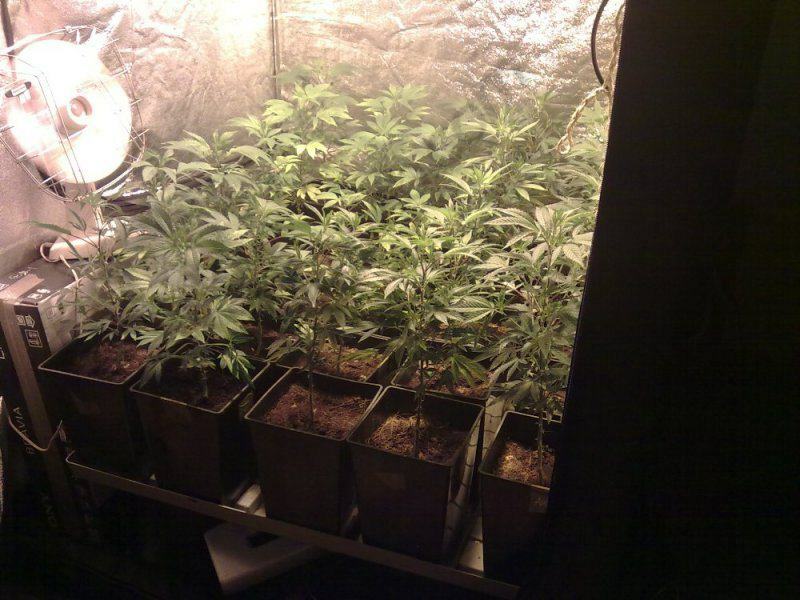 Since small plant pots are usually used in SOG setups, I’d recommend an automated irrigation system. Basically, you need a tank for your nutrient solution, a water heater to keep the solution at about 20 degrees Celsius, a water pump, some hose and drip stakes. This will save a loooooot of time!! We normally irrigate the plants 2-3 times a day for a couple of minutes during growth, and then 4-5 times a day during bloom. Please, feel free to contact me at dani@alchimiaweb.com, I’ll be glad to help! Hi Tay, sure, you could definitely do it like that as long as the photoperiod outdoor is correct for triggering flowering (less than 14 hours daylight). When is the best time of year to take cutting for overwintering clones from an outdoor grown female motherplant? Hi Sandra, thanks for your question, it’s a good one. Coincidentally I’m about to take the last batch of cuttings from my outdoor plants over the next week or so, as they transition into flower and start to stretch a bit. I like to do it at this time because they’re full of vigour, and the stretch period gives them a bit of extra growth to choose your cuttings from. I’ve even taken cuts while they’ve been in flower, they’ll root perfectly well and then start to re-veg after rooting, given the correct photoperiod, although i prefer to take cuttings earlier if I can help it. Hope that’s helped you out, all the best and happy growing!